My indoor vegetable gardening experiment is going pretty well. I'm already nibbling on the Swiss chard leaves and the radishes will be ready to harvest in a few days. I'm going to try several other crops to see what performs well in an indoor setting. I have no idea why I didn't try this sooner, it would have been a great way to combat the winter doldrums. Battle over Girl Scout Thin Mints lead to assault charges. Consumer watchdog group says organic food less tasty than conventionally grown produce. 16 Cents of Each Dollar You Spend on Food Goes to the Farm. What Happens to the Rest? Watch a CNN video connecting food prices with global unrest. The stats they mention are alarming. Farming inside the box: Urban agriculture of aquaponics. Scientist's letter raises concern about the herbicide Roundup and GM crops. Wow, 80% of all antibiotics used in the US go to animal agriculture. Are insects the meat of the future? No thank you, I'd rather give up meat entirely than eat bugs. First it was human cheese, now there's human ice cream! 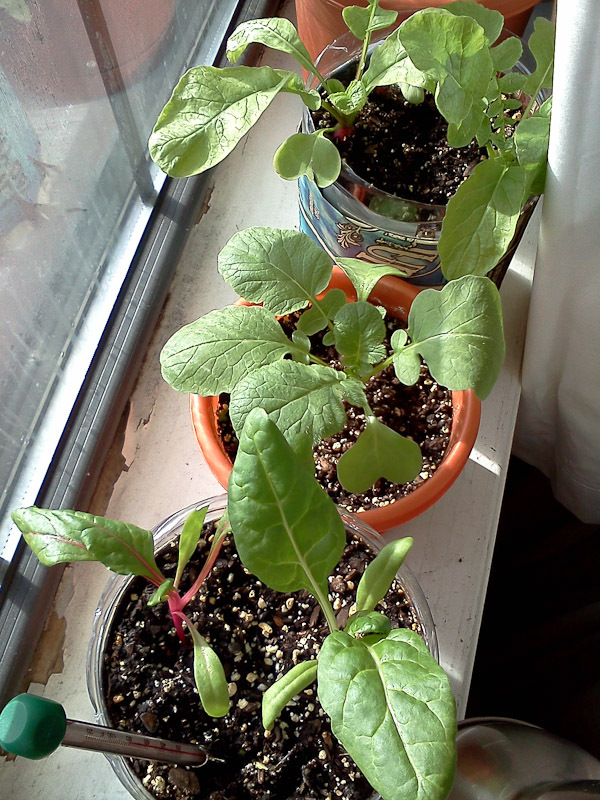 Wow you are growing radishes indoors! So cool! Can't wait to see the photos of the harvest!